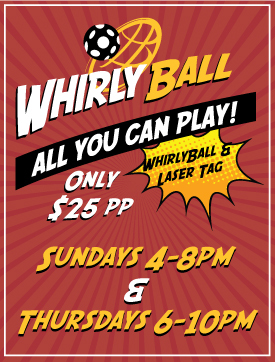 WhirlyBall is a team sport and a fun group activity. The playing court is approximately 4,000 sq. ft. and there are 10 WhirlyBugs on the playing court at one time, five red and five yellow. In one hand the player has a Jai-Alai style plastic scoop and in the other hand a steering crank. The ball being tossed around is a softball sized whiffle ball. At each end of the court, there are vertically hung backboards with a 15 inch hole in the center. Behind the hole is a plexiglass swing gate equipped with a buzzer to notify the referee when a score is made. The referee is the person sitting in the elevated booth above the court who will call play by play during the game, keep score and assess any penalties incurred. Before you go out on the court, the referee will go over the rules and give you a brief rundown on how to play WhirlyBall. Nothing. WhirlyDome provides the Whirlybugs, Scoops & Wiffleballs. Yes. Feel free to wear any shoes you are comfortable driving a car in. Depends on your group size. If your party is larger than 8, we recommend reserving the court by the hour. Otherwise, feel free to walk – in during any of our standard hours of operation.